Citation Information: JCI Insight. 2018;3(22):e123485. https://doi.org/10.1172/jci.insight.123485. Obesity is characterized by accumulation of adipose tissue and is one the most important risk factors in the development of insulin resistance. Carbon monoxide–releasing (CO-releasing) molecules (CO-RMs) have been reported to improve the metabolic profile of obese mice, but the underlying mechanism remains poorly defined. 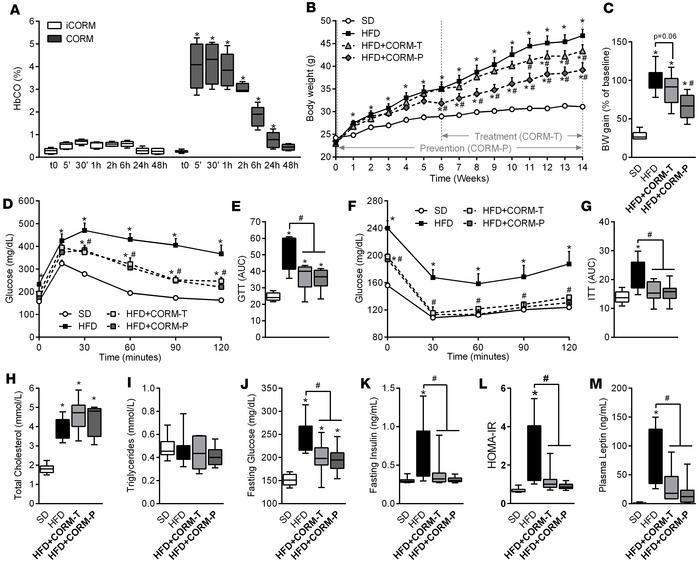 Here, we show that oral administration of CORM-401 to obese mice fed a high-fat diet (HFD) resulted in a significant reduction in body weight gain, accompanied by a marked improvement in glucose homeostasis. We further unmasked an action we believe to be novel, by which CO accumulates in visceral adipose tissue and uncouples mitochondrial respiration in adipocytes, ultimately leading to a concomitant switch toward glycolysis. This was accompanied by enhanced systemic and adipose tissue insulin sensitivity, as indicated by a lower blood glucose and increased Akt phosphorylation. Our findings indicate that the transient uncoupling activity of CO elicited by repetitive administration of CORM-401 is associated with lower weight gain and increased insulin sensitivity during HFD. Thus, prototypic compounds that release CO could be investigated for developing promising insulin-sensitizing agents. CORM-401 reduces body weight gain and improves insulin resistance in high-fat diet–induced obesity. Mice received a standard diet (SD) or high-fat diet (HFD) for 14 weeks. CORM-401 (30 mg/kg) was given by oral gavage starting either at the beginning of (HFD + CORM-T) or after 6 weeks of (HFD + CORM-P) HFD. Carbonmonoxy hemoglobin (COHb) was measured after oral gavage with CORM-401 (A). Body weight (BW) was measured every week (B) and BW gain was calculated as the percentage of the basal weight (C). A glucose tolerance test (GTT) was performed at week 13 (D), and data represent the area under the curve (GTT AUC) (E). An insulin tolerance test (ITT) was performed at week 14 (F), and data represent the area under the curve (ITT AUC) (G). Fasting total cholesterol (H), fasting triglycerides (I), fasting glucose (J), fasting insulin (K), calculated HOMA-IR (L), and fasting leptin (M) were measured after 14 weeks in all groups examined. Values represent the mean ± SEM. n = 4–6 mice per group (A); n = 8–10 mice per group (B–M). *P < 0.05 vs. control group (SD), #P < 0.05 vs. HFD group, values not designated with symbols are not statistically different, Student’s t test or 1-way or 2-way ANOVA with Fisher multiple comparison test.